REDEFINING WHAT IT MEANS TO BE A "FIGHTER"
A very cerebral workout, Jiu-Jitsu combines problem solving with muscle efficiency training to teach students how to use both their minds and bodies to conquer any situation life throws at you. "The Art of 8 limbs", Muay- Thai Kickboxing utilizes many different punches, kicks, knees and elbow strikes to created one of the most brutal and effective striking systems known to man. - Sparring is always OPTIONAL. A Mixture of Sport and Self-Defense Jiu-Jitsu, Our kid's BJJ program utilizes a combination of Brazilian Jiu-Jitsu, Wrestling, Judo and Strike defense to give the kids a well rounded system designed to not only teach them discipline and Problem Solving, But also realistic self-defense and life skills. Emphasizing technique over brute force, at Invictus, instead of combining our martial arts programs into one large program curriculum, such as "MMA", We take the time to separate and develop the programs individually in order to facilitate a deeper and more precise understanding of each martial art. At Invictus, all students are instructed to leave egos at the door when they arrive, as well as to help one another succeed on the mat. By this practice, students are able to evolve and grow faster all while avoiding injury caused by overly aggressive or out of control training partners. Jump in and get some training while you're in town! With An Ever Growing Community Of Students And Coaches - Find Out What Our Members Are Saying About Us Here And On Social Media. 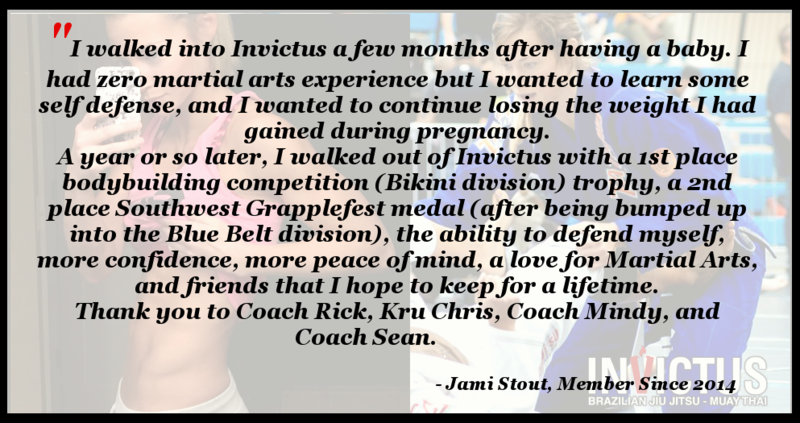 As a team, (including ownership and coaching staff) We all have full-time jobs and careers but we all come together at Invictus for the purpose of high-level training, stress relief, mental therapy and to help one another succeed in our many goals. At our core we are more than just a gym or martial arts academy. From the moment individuals walk through our doors they are treated as family. From our smallest child to the grandparents that use martial arts to stay healthy, everyone that joins our academy has the right to feel safe, receive expert-level training, and above all, be treated with dignity and respect.